Yesterday morning it was 21° here, and then there was a light freeze again last night. The clove currant made it through without visible harm. Most of my blueberries had row covers, and the covered parts appear ok, though branches that were sticking out don’t look so good. I have several varieties and covered the ones farthest along. It will take a few more days to see how extensive any damage is. The redbuds, however, didn’t make it. I have planted several trees around the house, which all have their own bloom time (genetic diversity is a necessity in changing conditions, especially climate change). None of them had open flowers, but the buds on some of them were much less developed than on others. They ranged from complete loss of flowers to about 50% survival. 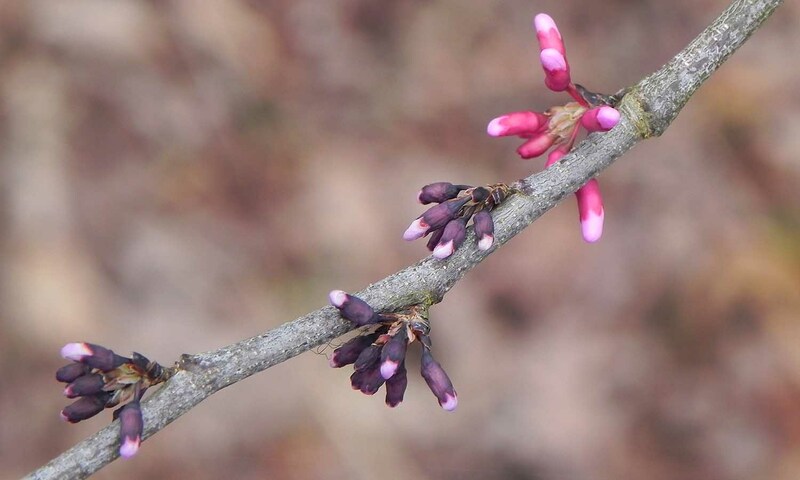 The trees, of course, will survive, but this is the first time in my life that native redbuds have been frozen while in bloom. On a similar note, the phoebes (eastern phoebe, Sayornis phoebe, in the flycatcher family) have left. They are awesome insect hunters, and have nested at my house ever since I’ve been in Dickson. I had been wondering how long they could afford to stay, since there are no insects out yet. The bright blooms made it through the freeze; the dark ones didn’t. Categories: Jennifer's Photos, Native Plant, Photographs | Permalink.